Chilly here; wish I was on the way to that beach, too. It was a very hot day here, far too hot to leave home. Nice that they're still enjoying the Autumn weather at the beach! They are dressed for some serious water work! But don't think I don't notice who is following closely behind them! Ha, ha! Yeah, I too noticed that you were just a few steps behind these the body beauties! Wonderful color shot. A day in the life... of 4 surfers. Going to play in the water! 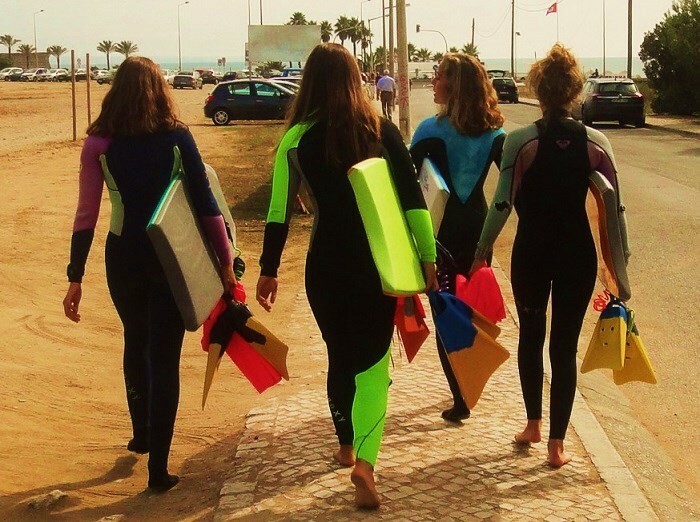 Ah, a day in the life of 4 surfers and one photographer!! I love it, Jose!! Thanks for the smiles to start my weekend!! I hope you are enjoying a wonderful one!! Love the shot, JM! A very fit group. What a 'cool' picture with all those colours. Very nice. Something I know nothing about. Is the water getting cold or are the suits for protection? @Bob: Surfers and bodyboarders spend so much time in the water that they need neoprene suits in order to keep their bodies warm. As the water gets colder in winter, suits are thicker. they don't care about autumn at all. Four surfers who look like they are in first rate condition.